On a merciless climb toward the end of the Tour de Tuck (aka Tuckasegee River Bike Challenge), Andy Stenberg’s quads suddenly and forcefully seized, pitching him sideways onto the asphalt with a thump. He gingerly lifted himself back in the saddle and managed to finish the abusive 105-mile ride, but the Ashevillian wasn’t alone in his agony. He recalls a scene of carnage unequaled in most century races—dozens of other experienced riders limping along the side of the road, pushing their bikes. In spite of the curvy course, only a pair of tandem riders, out of 235 participants in ’08, didn’t finish. And organizers expect a record number of cyclists at this month’s fourth annual running. The route begins in Sylva, where the town is hemmed in by the Balsam Mountain range. Most of the century unravels like ticker tape as participants pedal a sobering 11,000 feet of elevation gain. 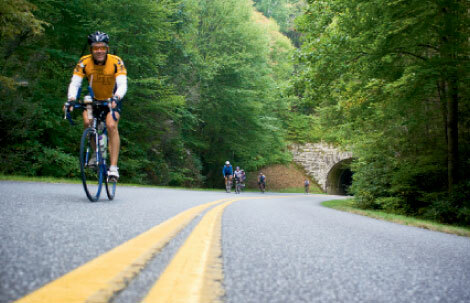 In all, the route includes 40 miles of the parkway—more than any other organized ride in the southern Appalachians. Stenberg regards the loop as possibly the toughest century in the Southeast. That’s a weighty declaration, especially when matched against other fabled mountain centuries with names as ominous as their topography: Brasstown Baldbuster; Blood, Sweat and Gears; and Blue Ridge Brutal. But many cyclists insist that the sustained climbing and white-knuckle descents make this route one of the most satisfying and challenging in the mountains. Scott Baker is the man responsible for the pain, as well as the glory. “I’ve had a few threats on my life once riders find out I designed the route,” jokes the local cyclist. Still, there are moments of true bliss—steep downhills and awe-inspiring vistas, including Lickstone Ridge Overlook on the parkway. There, a mere 30 miles into the loop, riders can catch their breath in the cool of the morning and admire the misty ridgetops. But it is possible to appreciate the grandeur of the Appalachians while pedaling inclines originally graded for combustion engines, as long as the ride is about the journey rather than the finish line. “With the tour, I’m thinking it’s not so much where I’m going to finish in the rankings, but if I’m going to finish,” says Stenberg, who suggests a sensible goal is not only to cross the finish line, but to be able to walk afterward. Stenberg clocked the sixth best time, six hours and six minutes, in the century (there is also a metric century). Impressive? Yes. But then again, no one is officially watching the clock. To protect the experience of motorists and cyclists, competitive racing isn’t allowed on the parkway, which means the Tour de Tuck isn’t officially timed. “We hope that riders won’t forget to look around at some of the fabulous scenery and have a deeper experience than just a competitive one,” says Chief Ranger John Garrison. And safety is the focal point of organizers and parkway administrators. “I think people tend to drive more carefully on the parkway because they aren’t in such a huge hurry,” says Chuck Small of Yadkin County, who points out that the tour offers a considerable break from busier highways on which many centuries and metrics take place. Still, riders should stay alert. The historic road has minimal shoulders, low guardrails, and no outside lane line. It isn’t recommended as a first-time century in the mountains because of its difficulty. Most of the cyclists participate in multiple races each year and train year-round.